The average cost of assisted living in Great Falls is $2,812 per month. This is lower than the national median of $3,346. To help you with your search, browse the 22 reviews below for assisted living facilities in Great Falls. On average, consumers rate assisted living in Great Falls 4.4 out of 5 stars. Caring.com has helped thousands of families find high-quality senior care. To speak with one of our Family Advisors about assisted living options and costs in Great Falls, call (855) 863-8283. The town of Great Falls, Mont., is known for its scenic environment with breathtaking attractions such as the Giant Springs State Park and First Peoples Buffalo Jump State Park. Local seniors can visit these or any of the other 56 parks in the Great Falls area while living in one of the seven local assisted living facilities (ALFs). Each of these facilities has a Category A, B or C license: A Category A facility provides help to seniors who need minimal aid with activities of daily living (ADLs) and are in good health, while a Category C community assists those who are cognitively impaired and cannot make fundamental decisions. A Category B facility is in the middle, helping those dependent on aid for ADLs and medication management but who can still make decisions for themselves. Each of these communities is licensed and regulated by the Montana Department of Public Health and Human Services. Frigid winters with average temperatures between 27 to 36 degrees may be a concern for seniors. The town does experience lower levels of rainfall year-round (14.73 inches) compared to the national average (39). Residents experience better air quality in Great Falls compared to the national average by 47 percent. Seniors with respiratory issues and allergies may find it easier to live here with pollution levels also being 95 percent better compared to the national median. The cost of living in Great Falls is rated a 95 compared to the national average of 100, making it more budget-friendly for low-income seniors. Although, groceries and goods and services can cost more than in other neighborhoods. The crime rate in Great Falls is considered 93 percent higher than in most other communities in Montana and 94 percent higher than cities nationally. The Great Falls area is home to world-class medical facilities, including Great Falls Clinic Hospital, in the event of medical emergencies or illness. Great Falls has an array of community resources for seniors, including the Aging Services, an organization that provides nutrition programs, community services, senior advocacy and Medicare counseling at its local senior center. Assisted Living costs in Great Falls start around $2,812 per month on average, while the nationwide average cost of assisted living is $4,000 per month, according to the latest figures from Genworth’s Cost of Care Survey. It’s important to note that assisted living rates in Great Falls and the surrounding suburbs can vary widely based on factors such as location, the level of care needed, apartment size and the types of amenities offered at each community. 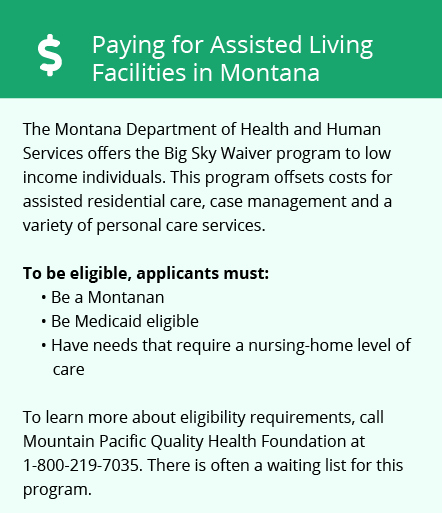 Seniors in Great Falls seeking financial aid can apply for assistance from the Montana Medicaid Big Sky 1915(c) Waiver program. Financial aid options to help cover room and board for seniors in assisted living are offered by the federal Supplemental Security Income (SSI) and optional state supplement (OSS) programs. 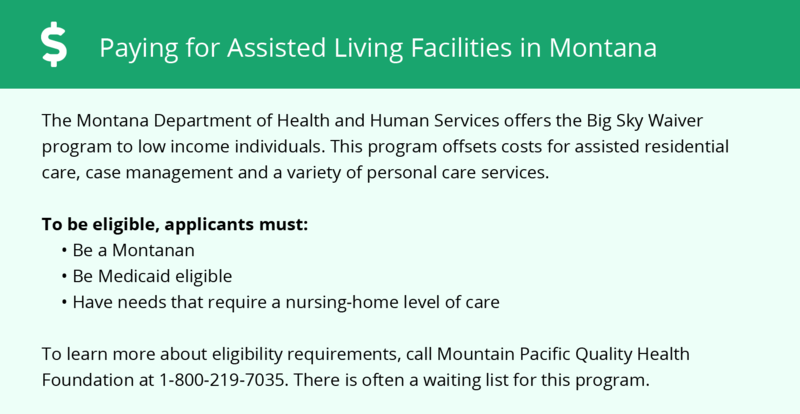 Learn more about these programs, plus who’s eligible, on our Assisted Living in Montana page. For more information about different ways to finance assisted living, visit our Assisted Living in Montana page. Great Falls and the surrounding area are home to numerous government agencies and non-profit organizations offering help for seniors searching for or currently residing in an assisted living community. These organizations can also provide assistance in a number of other eldercare services such as geriatric care management, elder law advice, estate planning, finding home care and health and wellness programs. To see a list of free assisted living resources in Great Falls, please visit our Assisted Living in Montana page. Great Falls-area assisted living communities must adhere to the comprehensive set of state laws and regulations that all assisted living communities in Montana are required to follow. Visit our Assisted Living in Montana page for more information about these laws.